We all need that little treat sometimes. Something that soothes us, something that gives us some pleasure, something that rewards us for our achievements, something that shows us how special life is, something that we can look forward to.. something that simply puts a smile on our face. Often enough this something is accompanied by all these nutrition and diet warnings which tell you that what you are craving is not good for you. Well…. if you are craving it than it’s something you need, hence, good for you. Right? 😉 If it makes you feel better than this can only be good for you. I am not talking about eating junk food the whole day and totally ignoring a healthy diet, but a little treat can only enhance the good mood and make the body produce endorphins.. win-win! When everything is in balance, nobody will say to stop eating some junk food from time to time. Plus, we all know how good chcocolate is for the body.. that’s when we like science.. when it points out all the good effects of chocolate consumption. So, when people tell me that I am messing with their diet, just because I was baking again or making candy, this is what I say.. “Chocolate is healthy. It increases your level of endorphines and with that increases your well-being, reducing stress-related symptoms!” You can look it up 🙂 There are tons of articles on the internet. Sure, nobody should overdo it.. the balance is what makes the difference. I am one of those people who definitely can’t really find the balance when it comes to sweet stuff. I am craving for sugar basically all day and cannot stop eating when I should. Oh, well.. nobody is perfect 😉 However, it doesn’t hurt to look for alternatives that make the over-consumption a little bit less harmful. A couple of weeks ago I was visiting the US and was enjoying my peanut butter toast for breakfast every morning. We all know that peanut butter is not the healthiest thing in the world, but it is not that bad when you take the one without any additional ingredients…(right??) I like the natural peanut butter.. ingredients: peanuts. It always feels like it is not THAT bad.. might be just my feeling though 😉 I could eat a whole jar at once.. I don’t think this is healthy, is it? I also like peanut butter cups (small portions of peanut butter.. better alternative than eating a whole jar), but there is milk in those you can buy at the store, so I don’t have them. When I came back from the US (a jar peanut butter in my suitcase.. how did that get in there? 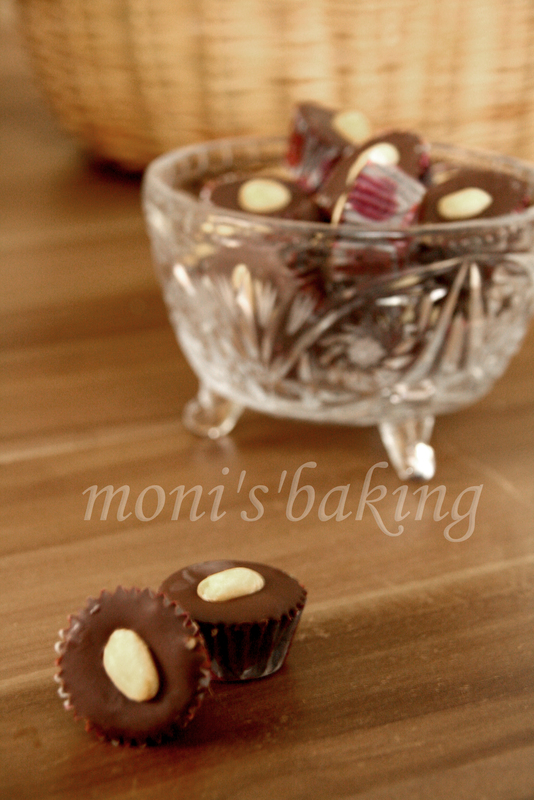 😉 ) I wanted to make some peanut butter cups myself. I made some for a friend a couple of months ago and she liked them, so I wanted to try it again. I melted some dark chocolate (we all know, the darker the healthier 😉 ) and poured a teaspoon into the moulds of a mini-muffin pan, which I lined with paper cups before. 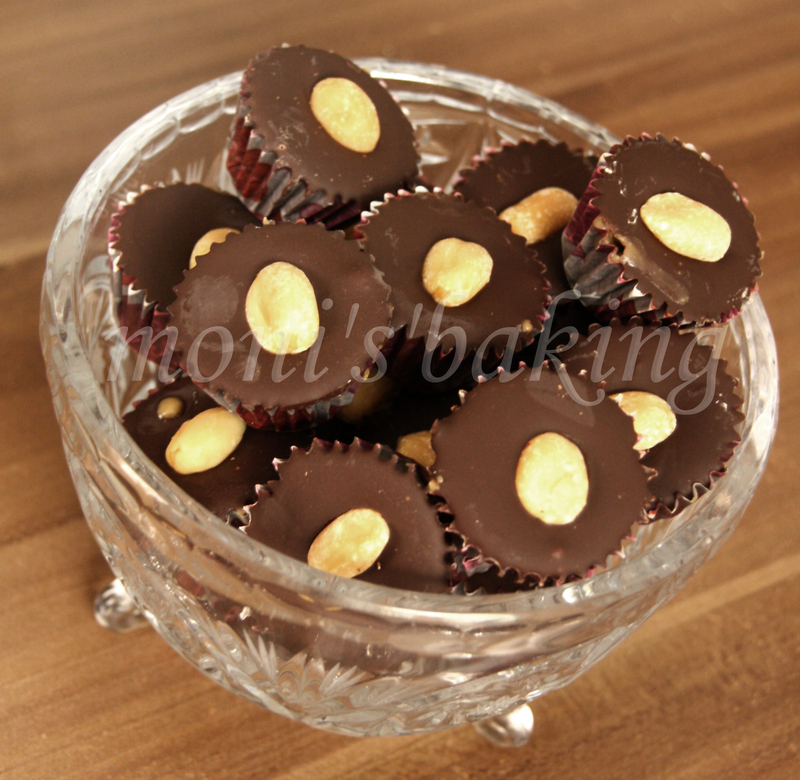 After a few minutes in the fridge I took a teaspoon natural peanut butter and filled the chocolate cups. Finally, I covered the cups with another layer chocolate and decorated each one with a peanut (I only had the salty ones at home, so I washed them and let them dry before using) and let it cool in the fridge. Done! Now, excuse me, please.. I have to go.. I am craving for something sweet and selfmade. See you soon.. enjoy the sweetness of sundays!